We’ve recently been recording trios from the fascinating melting pot that was 1840s Leipzig, with all sorts of connections between various composers. Details will be announced soon of the CD releases (2 CDs). The recordings include Robert Schumann’s exuberant Trio in F, Op.80 (listen to the first movement above); his wife Clara Schumann’s magnificent G minor trio, which should be heard much more frequently; the ‘Fünf Noveletten’ of the Danish composer Niels Gade, a close friend of the Schumann’s; the fiery C minor Trio of Mendelssohn, also a friend and colleague; and the mighty B major trio of Johannes Brahms, Robert’s protégé and Clara’s close friend. We hope you enjoy the sample on this page; keep an eye out for further news. Recorded live in 2011 (before Christian Elliott joined the ensemble) The Phoenix Piano Trio’s debut CD of Beethoven trios features the glorious E flat trio, Op. 70 no. 2, and the ever-popular ‘Archduke’. 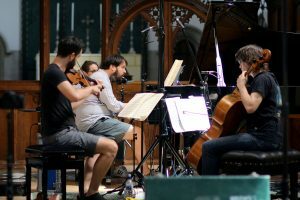 The disc was recorded live at the Holywell Music Room, Oxford, during the Phoenix Piano Trio’s Beethoven Cycle in 2011, and was released on Stone Records, with a launch at Wigmore Hall in 2012. 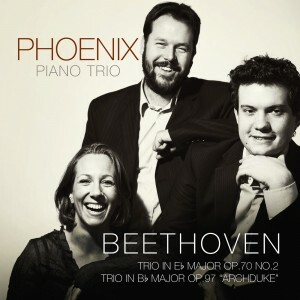 Click here to purchase the Phoenix Piano Trio’s Beethoven CD direct from Stone Records.